Anything you make a mistake about, I will get you out of, and anything you do well I will take the credit for. A turn-up in a million. Well you know, Chris, we’ve got to give them something and I think we’ll give them this talking shop in Strasbourg—the Council of Europe. If you open that Pandora’s box, you never know what Trojan orses will appear. There never has been a war yet which, if the facts had been put calmly before the ordinary folk, could not have been prevented. The common man, I think, is the great protection against war. 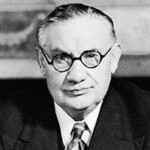 Ernest Bevin was born in Winsford, Somerset, England. He was a British politician and trade union leader. He co-founded and served as general secretary of the powerful Transport and General Workers' Union from 1922 to 1940, and as Minister of Labour in the war-time coalition government. His most important role came as Foreign Secretary in the post-war Labour Government, 1945–51. He gained American financial support, strongly opposed Communism, and aided in the creation of NATO.